What if princesses didn’t always marry Prince Charming and live happily ever after? 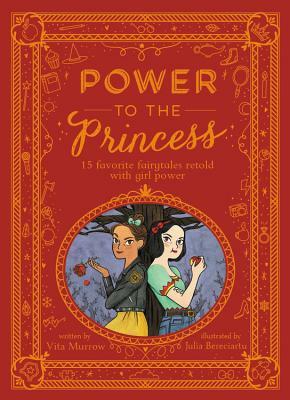 In this stunning anthology—elegantly presented in a red, clothbound hard cover with gold-toned metallic debossing—15 favorite fairytales have been retold for a new generation. These princesses are smart, funny, and kind, and can do anything they set their minds to. Vita Murrow is an educator, an artist, a writer, and a mom. Vita has a quirky sense of humor and an eye for the weird. When she was in 8th grade, she was rejected from a special writers’ retreat for kids. But that didn’t stop her from pursuing her passion. Since then, Vita has been a teacher, a producer, a film maker, a program director, and even a puppeteer. She’s also had jobs in an office which were pretty fun. She currently works as a children’s author reinventing old stories for a new generation and crafting wordless pictures books together with her husband Ethan Murrow. Their recent book “The Whale” was nominated for a CILIP Carnegie and Kate Greenaway Medal. Vita loves working with other artists and writers and is always looking to share a chocolate chip cookie with someone. Julia Bereciartu (a.k.a. Juliabe) is a Spanish illustrator, born in 1980 in the northern city of San Sebastian. From an early age, she spent most of her time drawing, even if that meant using markers on her parents’ new couch. She also loved reading books and dreamed of painting the illustrations that accompanied them when she grew up. She now lives in Madrid with her partner and their ginger cat, and has fulfilled her childhood dream of becoming an illustrator. Julia works for clients such as American Girl, Google, Cartoon Network, and Simon& Schuster, and loves giving life to quirky, sassy characters and the occasional fluffy pet.